Beans are intricately woven into the fabric of human history. The first 'permanent cultures' evolved when hunter-gatherers and nomadic people began tilling the earth and developing systems of agriculture, and beans were among the first cultivated crops. This progression served as a gateway from what could be considered a 'primitive' existence into a more stabilized one, which allowed for long term living situations to be established. With the knowledge of agriculture came the domestication of animals and the art of creating tools and implements. These three things combined, altered the course of human history in an unparalleled way, and beans played an integral part. There is evidence of peas that has been carbon dated back to 9750 BC, found by archaeologists Thailand. Evidence also exists that suggests, that native people of Mexico and Peru were cultivating bean crops as far back as 7000 BC. The use of lentils has been traced back as far as 6750 BC in parts of the present day Middle East. Chickpeas, lentils and Fava Beans have been found in Egyptian tombs that date back at least 4000 years. About the same time, (around 1500 BC) parts of present day Asia were growing and using soybeans. In a completely different part of the world, Native Americans and Mexicans were working with the haricot bean, a diverse category that includes runner beans, kidney beans and lima beans, and it's adaptability helped it to become a stable crop. It is apparent that beans were an integral part of the development of many cultures throughout the world. The early farmers who were growing beans also grew grains. (wheat, barley, millet, rice and corn) Beans and grains have a symbiotic relationship in which the amino acids of each complement one another in such way as to form a complete protein, which is the foundation for the growth and development of many life forms, including humans. Regional and cultural combinations such as lentils and rice, Lima beans and corn, and chickpeas (garbonzo beans) and couscous are a reflection of this correlation. The Native Americans exemplified this with their mixed cultivation of beans, corn and squash. (also known as the 'three sisters') With the onset of the age of European exploration came an increased exchange of beans and grains, as well as other potential crops, and as a result, the range of possibilities was expanded. 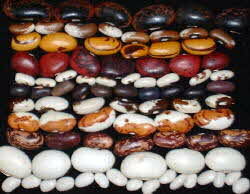 Beans are still an important part of world agriculture and are an essential part of a balanced diet in many countries. Beans have been used throughout the world for thousands of years. They come in hundreds of shapes sizes and colors, are versatile and amazingly convenient because they can be dried and stored for years. Soaking beans for a couple of hours brings them back to life, activating enzymes, proteins. minerals and vitamins. The benefits of using beans on a daily basis have recently been promoted because studies show beans help to reduce cholesterol while providing excellent nutrition. When combined with nuts, seeds or grains, they form a complete high-fiber vegetable protein. Most beans contain only 2-3% fat. Beans are the perfect food for a fat-restricted diet. You may never have to count calories again. Beans contain no cholesterol, and they can help lower your cholesterol level because they are one of the richest sources of fiber! Most beans contain at least 20% protein and are high in carbohydrates which provides longlasting energy. In addition, beans provide essential B Vitamins and Iron. Adding beans to your daily meals insures total nutrition, and with our wide selection of beans you should be able to find the right flavor for you.